The men who developed barbell strength training were seeking to improve on bodyweight training. However, barbell based training has both advantages and disadvantages. Here are the main advantages and disadvantages to use of barbells, dumbbells, and weight plates in strength training. Due to the construction of the barbell, you can adjust movement performance to accommodate every individual's unique body proportions of torso and limb lengths. Barbells and dumbbells allow novices to do exercises that mimic bodyweight movements but utilize a load smaller than the body provides. For example, with dumbbells or a barbell you can do bench presses with a load as little as 10 or 15 pounds, whereas a standard push up requires the strength to push about 65% of your bodyweight. Weight plates allow you to increase resistance in very small increments. I use plates as small as an eighth of a pound. By using small plates you can increase resistance in small doses, to which your body can more quickly and easily adapt. For example, you can progress in your pull ups or dips by one or two pounds of resistance at a time, which provides positive motivation for continuing to train, whereas with bodyweight movements alone it can be hard to identify small improvements in performance. Related to the above, using barbells you can more easily identify and track the resistance you are using. For example, suppose you have mastered basic pull-ups, and next progress to a tuck L-sit pull up. By this change in levers, how much have you increased the resistance? Unknown. Also, if you change the position of your tuck L-sit only slightly, you can either increase or decrease the difficulty of the pull-up. How do you standardize the performance so that you are certain that you are doing the exercise progressively from session to session? Using weight plates simplifies and objectifies progression. 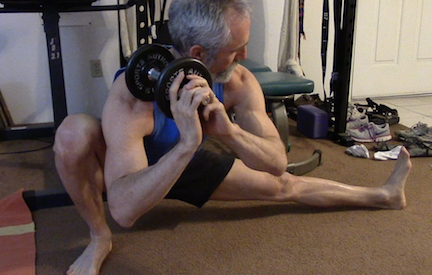 Barbells, dumbbells and weight plates are also useful for performing weighted flexibility and mobility exercises, which many adults need to overcome mobility deficits due to years of limited ranges of motion. Barbells and dumbbells are relatively inexpensive compared to exercise machines and gym memberships, and very durable. If well cared for, a quality set of cast iron weights and a power rack will last for several generations at least. Heavy squats and deadlifts subject the lumbar spine to large compressive and shear forces that can cause lumbar injury, the most common type of orthopedic injury caused by barbell training. You can easily injure yourself with even a small barbell plate by dropping it on yourself. You can get trapped under a barbell with some exercises such as bench presses and squats. For barbell training you need a decent barbell set and a safety power rack at a minimum. These items are more costly than equipment needed for strict bodyweight training. However, it is possible to acquire these items at a reasonable cost. Barbell equipment takes up more storage space in your home, or you need to purchase a membership at a commercial gymnasium. Barbells are not very portable for traveling. 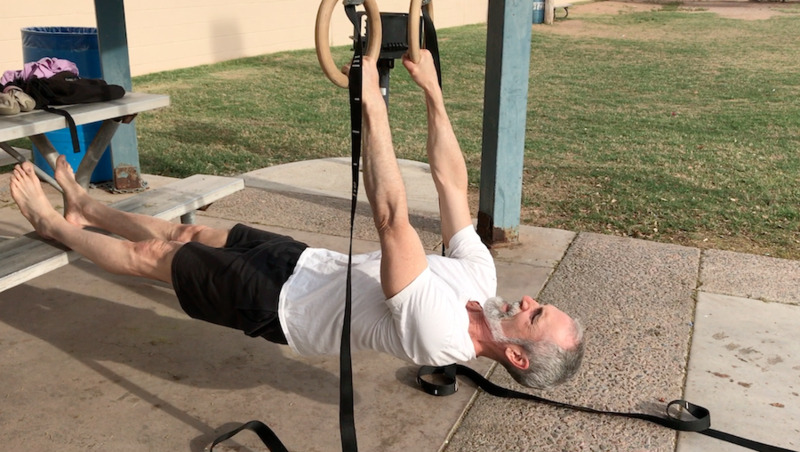 If you know how to use your bodyweight properly, you can get a very high quality training session when traveling by finding a public park. The more weights you purchase, the greater your financial expense. The less external resistance you use, the lower your investment in equipment. Considering physical training and development as well as safety requirements, a combination of gymnastic strength training movements – chin ups, push ups, dips, some waist exercises, bridges, and perhaps some optional levers, pike position, straddle split, and handstand training – with some additional weights seems ideal. Training bodyweight exercises like pike position, straddle position, bridges, handstands, L- and V- sits, single leg squat variations, and levers develops body awareness, alignment, strength and mobility in ranges of motion that are difficult or impossible to train with exclusive conventional barbell strength training. I believe that proper bodyweight training should be the foundation of all strength training programs. Proper bodyweight strength training will identify and correct the weak links in your body awareness, alignment, mobility and flexibility that can enhance your body composition and functional ability. Some of the remedial mobility and flexibility exercises we need to recover full shoulder and hip function from years of atrophy employ barbells, dumbbells, or weight plates to correct your imbalances. Exercise selection should minimize the use of external loads to limit the potential for injury from unstable free weights. Using some weight plates or resistance bands with a hip belt in combination with proper exercise form enables you to systematically progress in fundamental exercises like single-leg squats to develop the full strength potential of the lower body. Full Range Strength training programs incorporate some barbell, dumbbell and plate-loaded or band-resisted bodyweight exercises. The latest on the FRS YouTube Channel. To the Full Range Strength Newsletter for periodic tips to help you achieve your full potential.